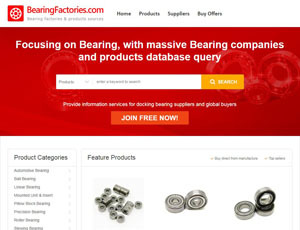 BearingFactories.com is an international e-commerce platform which focuses on the import and export of bearings. It has now established itself as the world's leading professional bearing online B2B trading site. Bearing Factory is a B2B marketplace connecting bearing buyers with suppliers all over the world including China. About BearingFactories.com - China Bearing Manufacturers Directory's recommend,only on behalf of the views and opinions about B2B Directory, if you have any suggestions , please feel free to contact with us, we will amend and correct them in the first time according your suggestions. More better B2B Websites recomend, Please click here.